"The Best Chair for Bad Backs"
Are you suffering from any type of back pain or sciatica and need an office chair that will allow you to sit without pain? Or, maybe you're not suffering from any back pain at all and you'd like to keep it that way! Here at the Healthy Back Institute® we have tested dozens and dozens of office chairs... everything from the $59 office supply store models all the way up to $3000 custom chairs and none of them even come close to this chair! We think you will find that this is not your ordinary office chair. Please note this product can take 5-7 business days to ship out. Your body abhors a static position like sitting and wants to freely move hundreds of times per hour. Even subtle movement provides huge benefits in back health. The unique and patented design facilitates movement from small, hardly perceptive ones to full recline and incline position changes. The seat and the backrest swing from a pivot point that matches your body's center of gravity and its center of motion, so they rotate in perfect concert with you. You are free to move while keeping a comfortable and biomechanically correct posture. Whether you're on the keyboard or on the phone, you'll experience full lumbar support that follows the natural path of human motion. The chair self adjusts so you'll never have to fuss with seat or backrest adjustments because it simply moves as you move, providing support and comfort in all positions. Men tend to slouch when they sit. 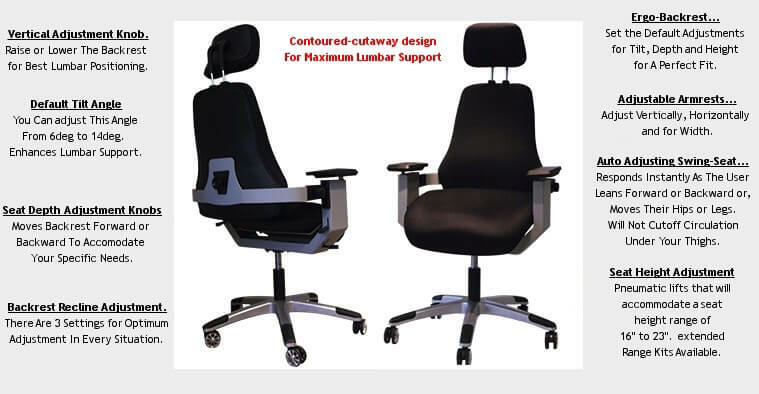 The unique design of the seating mechanism makes it virtually impossible to slouch and helps all users maintain good posture throughout the day, protecting their back and neck from pain. Because the seat and the backrest move independently, your back is always supported as are your hips and thighs no matter how you choose to work. This is especially important for women who often sit on the edge of their work chairs. The cushions are hand upholstered using high-quality foam and upholstery for comfort, good looks, and durability. The chair is ideal for everyone between 5'1" and 6'4" and up to 250lbs. You can personalize your chair to your body and your work space and then the chair automatically adjusts to your movement. You can assemble it in less than 5 minutes with no tools. Simply snap parts in place and turn a few knobs and you are ready to enjoy the best seat in the house or office. Once you sit in this chair, you'll never want to use another chair again! Order yours now using the form above and see for yourself why we and so many others love this chair. 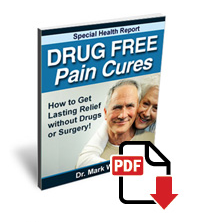 There are many all-natural methods for beating pain that actually do work... and you'll discover many of them in this in-depth 24-page special report. This short, power-packed special report reveals how to activate your body's natural healing abilities... and when combined with the the best chair for bad backs... ramps up the speed at which your pain disappears! "Where can I see this chair?" We have no showrooms, opting to sell directly to consumers. We also believe that you learn little about a chair by going to a showroom and sitting for a few minutes. You cant possibly duplicate your work environment under those conditions. The only way to know if this (or any) ergonomic chair will work for you, is to sit in it for a period of time, under the usual stress and routine that you must face everyday. When you purchase your first Back Pain Office Chair, you will have 90 days to make sure that you are 100% satisfied with that purchase. If, within 90 days of your receipt of the chair, you’re not completely satisfied, you can return the chair for a prompt refund of the purchase price, less shipping and handling. Please return product in good condition (in original packaging if possible). "I just had to write to tell you how happy I am with my chair (and to order a 2nd chair!). I was very skeptical at first since I rarely make large purchases on the internet but this is one I will never regret. I can't honestly remember the last time I bought a product that actually does what they say it will do. My legs no longer ache all day and my lower back has improved remarkably! Please ship me another chair for my home office. I can't sit without it anymore." "As a physician who has treated thousands of people for back pain and who also suffers from severe lumbar degenerative disc disease, my professional opinion is that this chair is the best chair for bad backs because its ingenious design delivers an ideal combination of gentle support while facilitating natural, health promoting motion. There is no other chair like it and I highly recommend it for anyone who must sit for long hours at a desk." "Like many folks, when searching for a chair, I assumed the Gold standard is one of those snazzy mesh back chairs but I was so wrong! This chair is simply in a class by itself. Why would anyone want to sit and adjust levers all day in a chair that has poor back support no matter how you adjust it! No doubt in my mind, all chairs will be like this someday. Many thanks..."
"I sit up to 8 hours a day (not by choice, but I'm a programmer) and it has made the difference between continuing on with my work (hopefully for years to come) or find some other way to make a living. Thanks for such a superb product!" "I would like to thank whoever came up with the idea for this chair. It's hard to imagine from just looking at a video how good this chair is but it is the first chair I have sat in for 30 years that actually provides real lumbar support. Thanks!" "Absolutely the best office chair you can buy. My company won't pay for specialty chairs (they don't understand ergonomics) but that's OK. I have never regretted the decision. Thanks for such a wonderful chair!" You must first call the manufacturer at 888-682-6151 to get your RMA#. Yes. Your chair comes with a 5 year warranty that begins the day you receive the chair. If at any time during that period you have a problem that is the result of a manufacturing defect, we will repair or replace it at no charge. Backrest: Height 20-22", Width 19" Seat: Width 18", Depth 17" Height adjustable from 15"-23"
"What is the material that covers the Chair?"